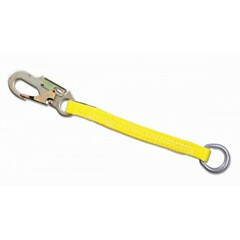 Self-retracting lanyard/lifelines are popular devices among professionals who work at height. 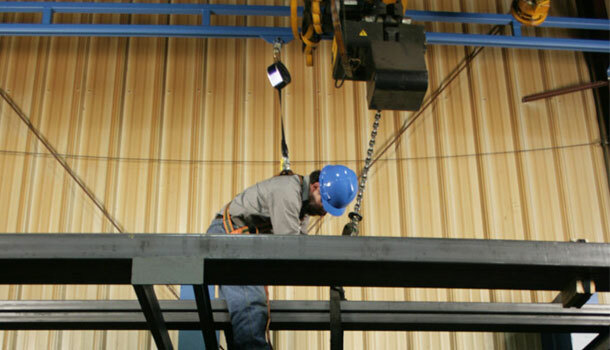 These fall arrest systems can save lives but they can also be dangerous if used improperly. The use of an SRL can seem easy, as it's basic functions are just like a seat belt, but it is important to pay attention to proper use. Where is the best place for using an SRL? Retractable lanyards are designed to arrest free falls within inches. The best place to use a SRL is overhead. 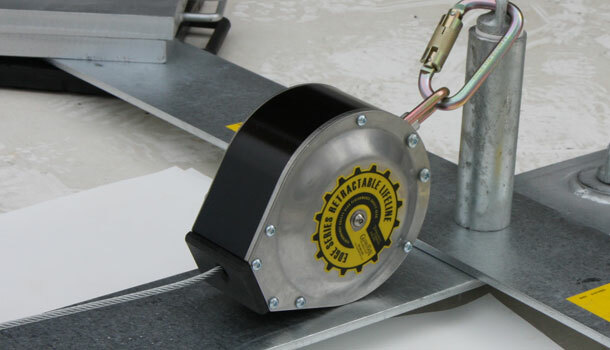 A SRL can also attach to overhead anchor points or moveable overhead lifelines like the Tether Track by Gorbel. When is it OK to use a retractable at your feet? Use precaution when considering this, the SRL must remain in vertical position and cannot lay on its side or it will effect the fall distance. You will need the shock pack to absorb the additional fall energy and a cable line to resist damage from a leading edge. The retractable should clearly be marked as certified for use on a leading edge. What is a leading edge, and what features are important in an SRL when working on a leading edge? Leading edges are dynamic environments. They are the edges of floors, roofs, decks or other walking-working surfaces which move or change location as additional sections are constructed. For example, each time a piece of plywood is placed on floor joists, the relative position of the unprotected edge changes. "Unprotected sides and edges." Each employee on a walking/working surface (horizontal and vertical surface) with an unprotected side or edge which is 6 feet (1.8 m) or more above a lower level shall be protected from falling by the use of guardrail systems, safety net systems, or personal fall arrest systems. Be aware of recertification requirements. Some retractable lanyards need recertification and some don't -- consult manufacturer's instructions for details on your SRL. A good practice would be to conduct frequent maintenance of your retractable, this will help to extend product life time, and help ensure product functionality is maximized. Self Retracting Lanyards/Lifelines are designed for rugged use. However, they are mechanical devices that may require service at some point during their use life. All SRLs should be serviced after a fall has occurred. Find out what is required from your retractable manufacturer and plan accordingly. Are rescue plans are still required when using an SRL? 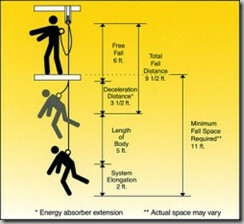 A rescue plan should always be in place before using fall protection equipment. Always make sure you and your employer have carefully reviewed and signed off on the plan prior to work. A swing fall can occur using a retractable with an anchorage point that is not positioned directly overhead, a swing fall or pendulum effect will occur. Striking an object while swinging can cause serious injury or death. Since self-retracting lifelines allow for greater horizontal and vertical mobility than standard six foot shock-absorbing lanyards, extra care should be taken to reduce swing falls. 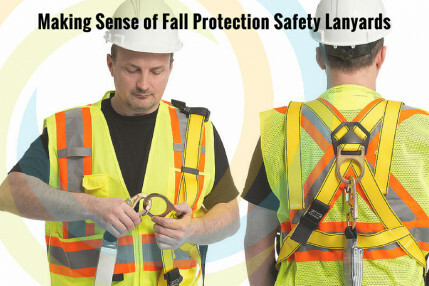 Whether you are using a shock-absorbing lanyard or self-retracting lifeline, it is extremely important to position your anchorage point directly overhead whenever possible to minimize the risk swing falls. Bad habits and lack of supervision can lead workers into thinking their experience with different types of equipment is adequate. Some workers think that it is OK to mix different equipment components to their systems to achieve a lightweight or low-cost design (Eg. using mountaineering snap hooks and harnesses in an industrial fall arrest system). This type of misuse is dangerous and should be monitored. A personal fall protection equipment system should be designed, tested, and supplied as a complete system. Both the employer and employee should understand that equipment components of a system may not be interchangeable. Ask your safety supplier or contact the manufacturer for further questions regarding your fall protection equipment system. Roll-out can occur when a non-locking snap hook is unintentionally mated to an attachment point. Accidental disengagement or roll-out can result when the force of a fall arrest rebounds back up through the lanyard/lifeline depressing the gate and allowing the snap hook to pop loose or "roll-out". "The snaphook or carabineer shall be capable of withstanding a minimum load of 220 pounds without the gate separating from the nose of the snaphook or carabineer body by more than 0.125 inch when tested in accordance with Section 7.4.3.1. The gate of the snaphook or carabineer shall be capable of withstanding a minimum side load of 350 pounds when tested in accordance with Section 7.4.3.2. Failure shall be defined as permanent deformation of the gate more than 0.125 inch, or separation of the gate from the body of the snaphook or carabineer body by more than 0.125 inch." According to OSHA, construction industry use doesn't require heavy duty gates, although it is a requirement for general industry use. Never attach a snap hook back on it's own lanyard (unless it's a certified tie-back lanyard). For more information on safely using an SRL please feel free to contact us via phone or email. View our selection of Self Retracting Lifelines and Lanyards.